In surveying the literature on war and its aftermath, including the literature on Post Traumatic Stress Disorder (PTSD), there is virtually nothing about the families of veterans. These families are the scapegoats of war. Their story is timeless but the author believes the time has come to tell it. The RAND Corporation study initiated by the National Military Families Association reports that military families have more emotional distress and anxiety than the general population. 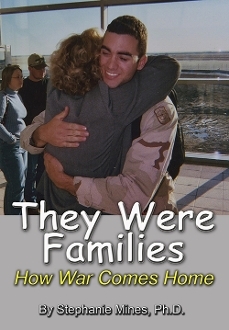 95% of these families feel that others (outside the military) are unaware of their dilemmas. They are correct. The needs of the families of our veterans are, for the most part, ignored. In particular, their children are not given the support they need to offset the toxic conditions of war that is brought home. The distress in the homes of veterans creates an epigenetic burden that is carried most heavily by children. Investigations into the mechanisms of the intergenerational transmission of trauma reveal that the children of veterans who have seen combat and who have returned from war with PTSD are more prone to violence; are at a higher risk for behavioral, academic and interpersonal problems; have difficulty maintaining friendships; are more likely to have sensory challenges or to be diagnosed with autism; are at higher risk for depression and have difficulty concentrating. Knowing all this, what do we provide to take this burden off the shoulders of children and families? Close to nothing. Three simple, initial steps can begin to shed light on this shadow: Education; Resources; and Family Centered Transition. This is a book devoted to these three steps. When the author discussed these steps with civilians they frequently respond, in all innocence, by saying: “Don’t we already have this?” These three steps are so common-sense, so obviously needed, that the assumption by people who have not investigated this issue is that it has already been taken care of by the powers that be. Surely “they” know this. But there is no “they.” We must be the “they” that voices this obvious need and advocates for its fulfillment. It is a tall order, but it must be done. Stephanie Mines, Ph.D, is the founder and Program Director of the TARA Approach for the Resolution of Shock and Trauma (www.Tara-Approach.org). She is a founding Board member of Veterans Families United (www.VeteransFamiliesUnited.org). Along with VFU’s Executive Director, Cynde Collins-Clark, she has created a transition facility design (REST House) for veterans and their family members.